We’ve got just less than 6 weeks to go now to the 26.2 mile Virgin London Marathon. 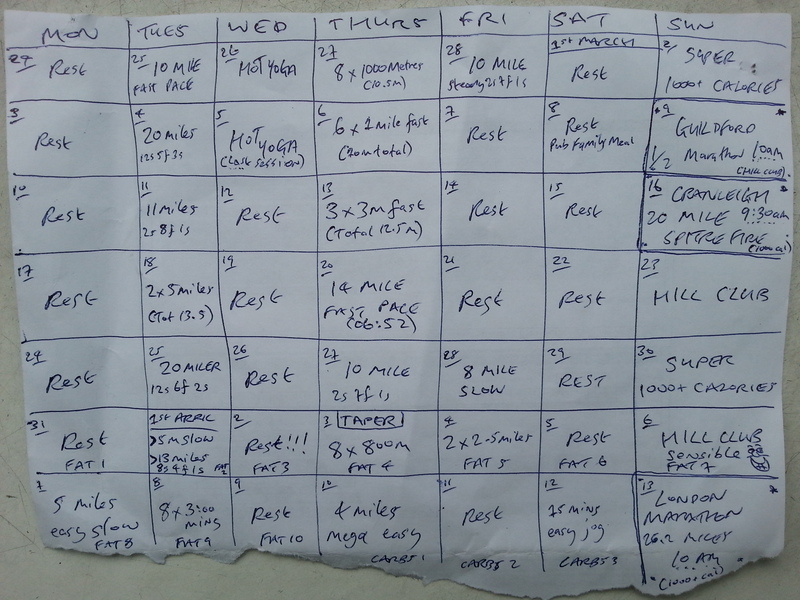 It took me sometime but I enjoyed planning all the training days and putting them down on paper. I will stick to that religiously and won’t let anything get in my way touch wood. I thought I just had a few more long time consuming knackering runs to fit in but if you zoom in or can read the mileage speeds frequency volume intensity etc in the below photo that I’m going to do I’ve got lots of hard work for more 4 weeks before the easier tapering fortnight easy runs. 14 days prior and for 10 days in total I’m going to healthy FAT load. Then I’m going to CARBO load for 3 days as based on the advice and full details in the below blog / article. My charity is laying on a free leg massage, wine and selection of food at the Reform Club Pall Mall ten minutes walk from my finish line. My wife and in laws will join me.